Drop-in activities: Saturday 8 & Sunday 9, Saturday 15 & Sunday 16, Friday 21, Saturday 22 & Sunday 23 December, 11-5pm. 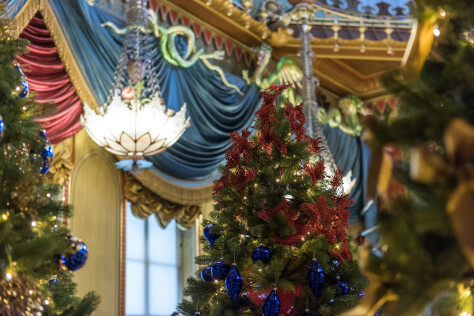 Experience a magical Christmas at the Royal Pavilion. The fires are lit, the spectacular Banqueting Room table is laid with Georgian style desserts, and the palace is transformed with festive decorations and glittering trees. A replica of Queen Victoria’s sleigh awaits you and your family in the Music Room, where you can create your Christmas photos to remember the day! Celebrate the festive season in King George IV’s beautiful former royal palace. Join us for a glass of sparkling wine and a canapé reception in the palace’s historic Great Kitchen, followed by a three course dinner with wine and coffee in the dazzling setting of the Banqueting Room. Catering is supplied by JRC Events. Private tables of 10 available; smaller groups will be asked to share a table.